Back by popular demand! Gunhild is back after taking the audience by storm at her Regattabar debut last November. 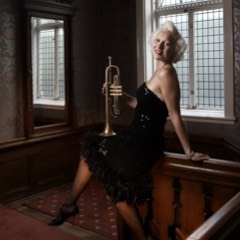 Gunhild Carling is a Swedish jazz musician and multi-instrumentalist. She is famous for playing three trumpets at the same time. Carling became known for her performance at Allsång på Skansen on July 20, 2010. Gunhild plays trombone, bagpipes, trumpet, recorder and harp, and will often showcase all of her skills in one song, sometimes casually breaking into a tap dance or singing lyrics. Carling competed as a celebrity dancer in Let's Dance 2014 on TV4, placing third. In 2013, she performed with her 'Carling Big Band' at the Royal Palace in Stockholm in the celebration of King Carl XVI Gustaf's Ruby Jubilee. In 2016, Carling performed at King Carl XVI Gustaf's 70th birthday celebration. She is featured as a singer and multi-instrumentalist in several of Scott Bradlee's Postmodern Jukebox's adaptations of pop songs, including their version of 'Never Going to Give You Up', a 1920s jazz swing version of 'Material Girl', a vintage jazz version of Europe's 'The Final Countdown' and a jazz cover of Pharrel Williams' Happy'.